Baroness Warsi is to be applauded for her resignation from the ConDem UK government over the British prime minister’s unquestioning support for the ongoing Israeli policy of terrorism and genocide carried-out against the innocent people of Gaza. The rightwing UK media is to be condemned over its racially motivated attacks aimed at Baroness Warsi for her principled stance against David Cameron, and the courage she has shown in face of her own Conservative Party’s indifference to the plight of Palestinian children, and the general air of pro-Israeli warmongering that exists amongst its upper echelons, at exactly the same time that the proletariat of the UK is being brainwashed by the state to eulogise the 1914-1918 holocaust perpetuated against it – otherwise affectionally known by the bourgeoisie as ‘World War I’. Baroness Warsi, due to her ethnicity and complexion, is being accused by the odious Daily Mail of ‘betraying’ the prime minister essentially because she is not ‘white’. This is the default position of the rightwing when it policies of prejudice and discrimination suffer the embarrassment of being exposed for what they really are. It is something of an anathema that Baroness Warsi – and others of distinct ethnicity – would hold conservative views, and pursue rightwing values, when such attitudes are obviously designed to be detrimental to minorities of all kinds. Baroness Warsi possesses many faults, but these are not the product of either her ethnic background, or her. The Baroness, for instance, has continuously used her success as a prominent rightwing politician, to give expression to vicious homophobic sentiment, and ruthlessly attack the gay community through the UK popular media. In this regard, the Baroness had no qualms in attacking a British and worldwide minority that has suffered discrimination, hatred, physical attack, and in certain cases – murder – simply for expressing a preferred sexual orientation. The Baroness, although presented by certain sections of the UK media, as being ‘working class’, has nevertheless fully supported the prime minister’s policies of attacking the poor, the destitute, migrants, the homeless, the disabled, and the unemployed. The Baroness has set about the task of dismantling the British welfare state and the National Health Service, with a distinct sense of relish. As Black, White, and Asian British people suffer hardship under these cuts, the Baroness has remained silent at their plight and made no move whatsoever to assist these victims of Tory bigotry. It would appear that Baroness Warsi has no problem ignoring the suffering of multicultural Britain. This expert manipulator of the media whilst she was in a position of governmental power, never once questioned the morality, logic, or ideological validity of current Tory policy toward the ordinary and often vulnerable people of the UK. Workers toiling for an ever decreasing wage, disabled people dying of starvation because many have not understood the benefit cuts enacted against them, and workers and unemployed queuing together at poorly supplied food-banks in the hope that they can make ends meet for another day. The cutting of unemployment benefit to such a low level that virtually no one can survive whilst living on it, coupled with the abolishment of Council Tax Benefit for most people, and drastic reductions in Housing Benefit, has had disastrous effects upon the UK poor and vulnerable, and the British working class in general. All this has been applied to the working class at a time when the middle and upper classes have received pointless and extensive tax-cuts that serve no purpose other than to deprive the poor of essential services, and secure votes for the Tories. 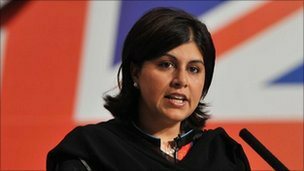 These are the extensive and profound faults of Baroness Warsi that form the foundation for the ridicule and criticism she so readily deserves from the British leftwing, which must stand clearly for anti-racism, and defend the rights of Baroness Warsi as an individual, even if she does not, as a rightwing politician, feel she should defend the rights of the British working class. It is the ‘red flag’ of Socialism, and not the ‘blue water’ of Conservatism that clearly leads the way in this matter. The people of Gaza – and the working class – will be freed through historical forces and not in spite of them!